Wing’s LSU days are most likely over. (Photo: Steve Franz, LSU photography). 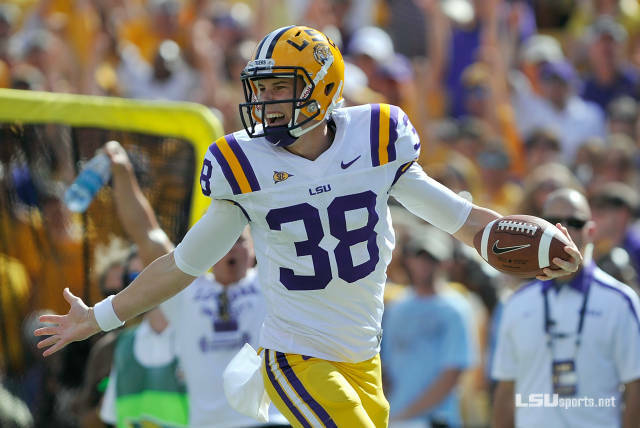 For the LSU fans who adore punter Brad Wing and his unconventional yet exceptional punting ability, he may never dawn a Tiger uniform again. For the second time this season, the Aussie will not be on the team roster after a failed drug test. This means Wing will not be traveling to the Chick-Fil-A Bowl when LSU faces the Clemson Tigers come December 31st. Freshman Jaime Keehn, an Australian native, will assume kicking duties. Wing has been in head coach Les Miles’ doghouse before after he suspended Wing for the Tiger’s home opener against North Texas. At the time, Miles called it a hamstring injury, but as reports surfaced, it was suggested Wing failed a drug test. With two failed drug tests and suspensions under his belt, Wing will likely leave the program and head for the greener pastures of the NFL. It is indisputable that Wing has the strong leg and accuracy to be successful at the next level. Last season, Wing averaged an impressive 44.8 yards per punt off of 59 punts. Additionally, he consistently punts the ball in excess of 50 yards and has the accuracy to pin teams deep in their territory–two skills a number of NFL teams look for in punters. NFL scouts project Wing to be the #1 punter on the draft board and he should have no problem landing a roster spot.